The Sensor cook will automatically adjust the time and cooking power to keep your foods juicy and appetizing. 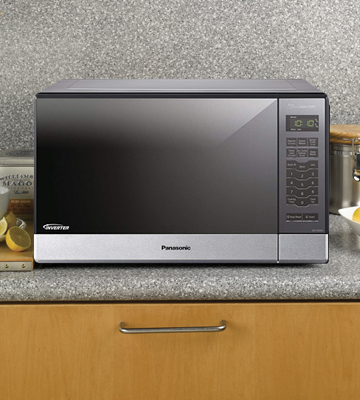 A special Effortless™ Reheat function will help perfectly reheat any meals at a single touch of a button. The completion alarm is rather loud. Yet, you can turn it off. A smart, durable, and powerful, this built-in microwave oven from Fridigaire will deliver consistently high performance while requiring minimum maintenance. With over 30 cooking options available and "user preferences" memory function, it will become your reliable and truly helpful kitchen assistant for years to come. 13-3/8" x 24" x 19-1/8"
With the Quick sec and Quick min options, you can add from 30 seconds up to 10 minutes to the set cooking time to achieve the desired cooking result. The light inside the cooking chamber is not bright enough. 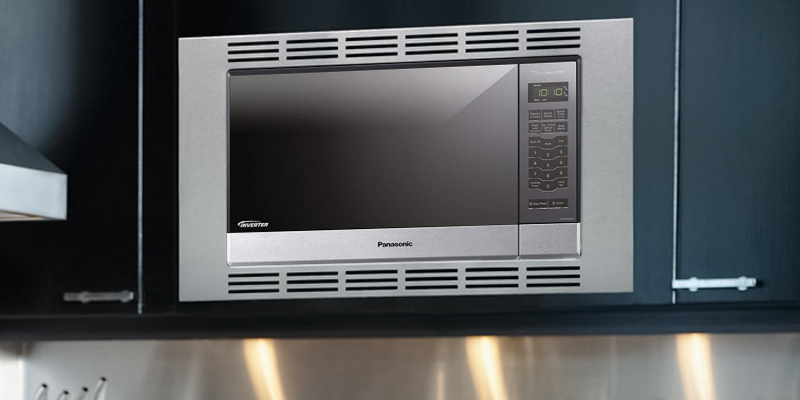 This high-capacity wall microwave cleverly combines impressive power with the Panasonic patented inverter technology to allow you to achieve perfect cooking results each and every time, regardless of your culinary skills. Safe and pretty compact, it is suitable for families with small kids and will fit into any kitchen. 14" x 23 7/8” x 19 7/16"
Thanks to the Express Cooking quick start controls, you can delay the cooking program start for 1 to 6 minutes. Even if you have to walk away from the kitchen, you can rest assured your meals will be cooked in time. 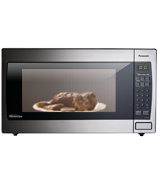 It's a compact stainless steel built-in microwave that will make a perfect choice for a 2-3 person household. At an affordable price tag, it offers a modern sleek design and a complete set of all the necessary functions we most often use on a daily basis. It will efficiently heat, defrost and cook different meals and even beverages. 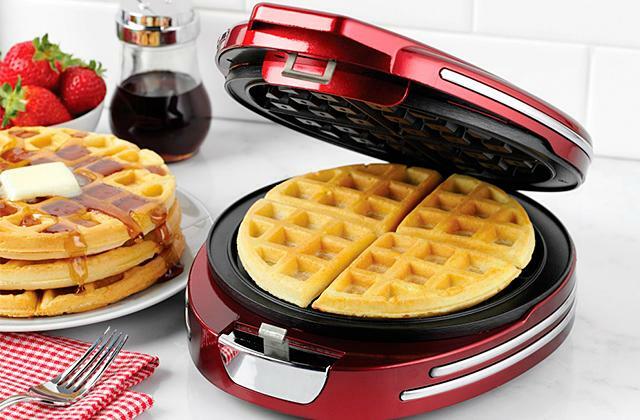 12.4" x 20.4" x 17.3"
Featuring 14 auto cook modes and 3 Popcorn cooking options, this model will let you cook a whole variety of dishes for breakfast, lunch, dinner or special occasions, as well as quickly defrost and reheat foods. The glass door is prone to fingerprints. The Panasonic NN-SN686S combines modern design with high-tech functionality. Intuitive controls make it easy to adjust to different culinary tasks at hand, while versatile programs and modes make it suitable for any cooking needs. 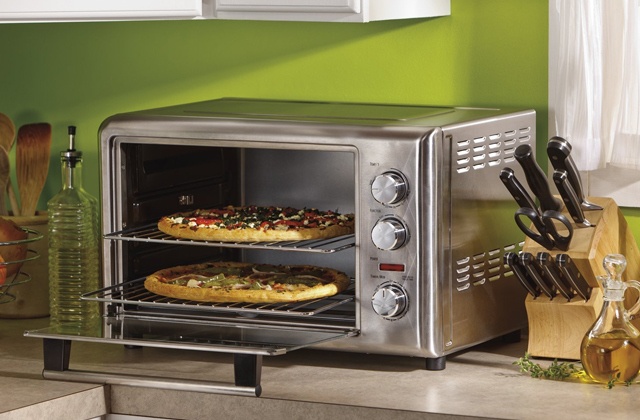 With this microwave at your disposal, cooking won't be time-taking and tiresome anymore. 12 1/4" x 15 13/16" x 20 11/16"
The menu of automatic cook options includes Ground meat and Fish/seafood modes that further expands the unit functional versatility and let you cook with more precision. Defrost settings adjustment is a bit complicated. Distinguished by a drawer design that has become extremely popular over the recent years, the Sharp built-in microwave cabinet is an optimal choice for open-plan kitchens and kitchen islands. It is easy to use, easy to access, and easy to clean. Unlike turntable models, it can accommodate larger and taller dishware. 15.88" x 23.88" x 26.19"
When choosing a built-in microwave as part of kitchen remodeling, two things we seek most are functionality and reliability. With the Frigidaire 24-inch built-in microwave, you'll get both and then some. This model features a sleek minimalistic design with a stainless steel exterior and intuitive digital controls. The Smudge Proof stainless steel is resistant to fingerprints and very easy to clean so it will look good a long time. The door of the oven is opened at a push of a button, meaning your fingers will not contact the exterior surface all that often, contributing to the ease of maintenance. You can integrate the unit into the cabinet right above your conventional oven or build it into one of the cabinets on a kitchen island. Both options are viable. In addition to stylish design and ease of maintenance, Frigidaire's FGMO205KF microwave stands out for its functionality. 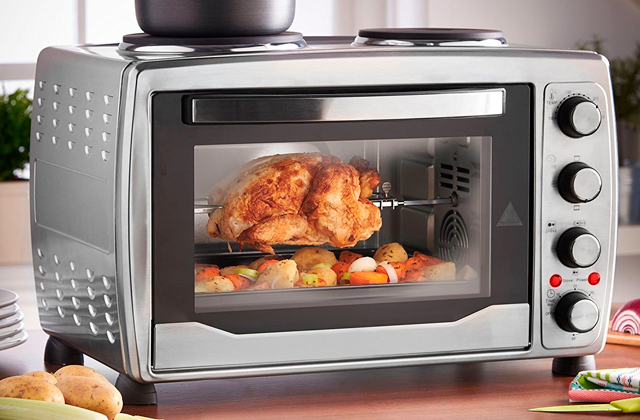 It boasts 30 cooking options and has the power of 1200 Watts so you can spend little time cooking and achieve great results each and every time. 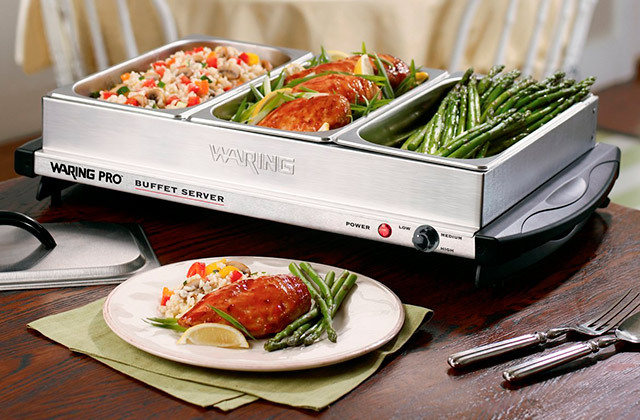 With all those settings, you will be able to do so much more than simply reheating leftovers. What's notable is that most of the functions are automated to take the guesswork out of cooking tasks. Thus, Auto defrost and Auto reheat options will automatically adjust the operation time depending on the type of ingredients used. 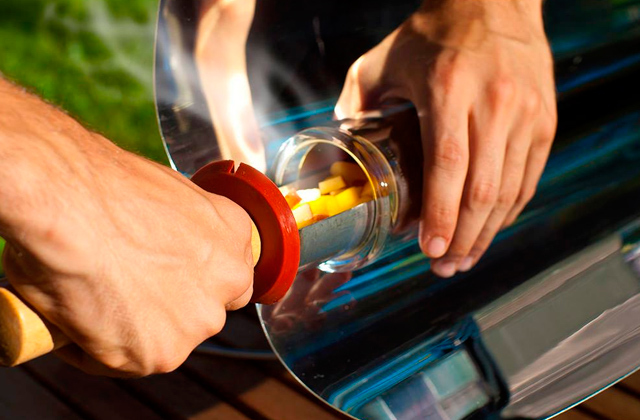 The Sensor cook will customize the time and cooking power to keep foods juicy and appetizing. The unique "user preferences" memory function will allow you to save the settings you use most of the time. 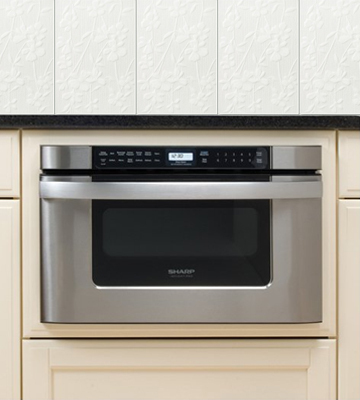 Combining a well-thought design with top-of-the-line functionality, the Frigidaire stainless steel built-in microwave has all the potential to become your reliable kitchen helper for years to come. 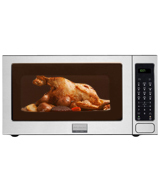 A microwave is an appliance most people buy as an auxiliary kitchen tool to add to their stove and oven. And let’s be honest, many of us hardly use it for something else besides preheating meals and maybe making popcorn. 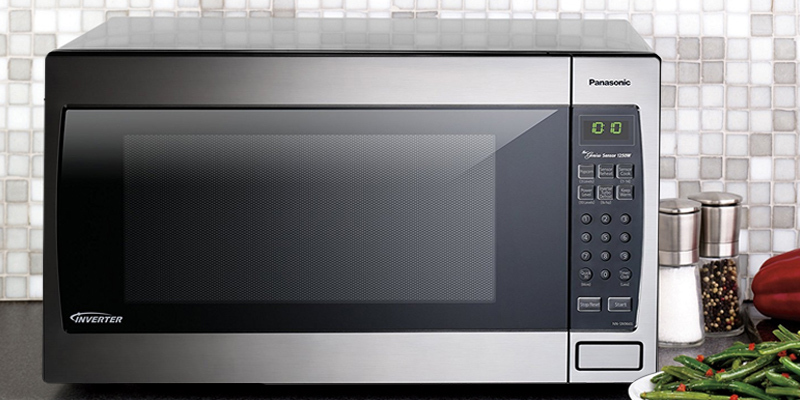 Yet, a top-rated microwave can provide you with much more versatility, and if that's exactly what you need, the Panasonic NN-SN966S can be your best bet. Two things you will like about the Panasonic NN-SN966S at the first glance are its sleek, modern design in stainless steel and intuitive controls conveniently located on the right. However, these aren't the only merits of the model. In contrast to many rivals, the Panasonic NN-SN966S provides two installation options - you can both place it on a counter or build it into a wall or your kitchen cabinet. However, it's not only its easy-to-install design that makes the Panasonic NN-SN966S one of the top-sellers. Other reasons behind its popularity include its capacious cooking chamber, high power, and outstanding functionality. This model boasts a 2.2 cu.ft. cooking chamber capacity that is almost twice bigger than what you get from the range. Add to that a 16-inch turntable and what you get is a microwave with ample room for cooking several servings of food or even baking whole poultry, if you choose. Now, the Panasonic NN-SN966S is not only generously-sized, it is also very powerful. 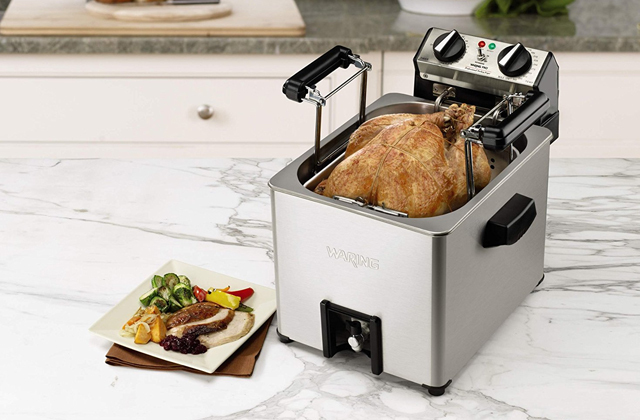 With the power of 1250 Watts under its hood, this model is able to greatly expedite the cooking process, and the patented Panasonic inverter technology will make sure that you get perfect cooking results, regardless of the type of food you place inside it. In addition, the Panasonic NN-SN966S offers 10 power levels and several preset operation modes for cooking, preheating, and defrosting foods. Also included is a "Keep Warm" function. 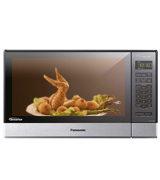 In all, the Panasonic NN-SN966S built in microwave has a lot going for it. 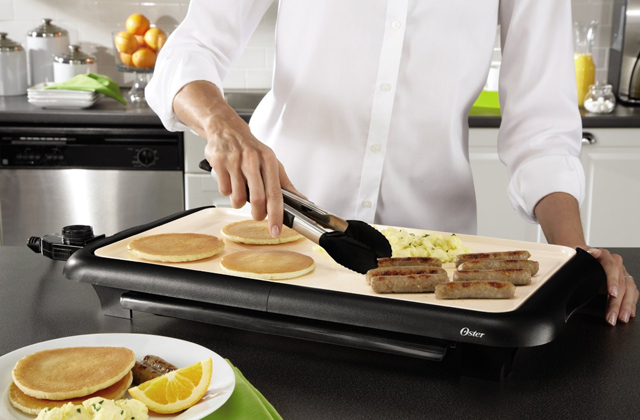 It's functional, powerful, and cleverly designed. 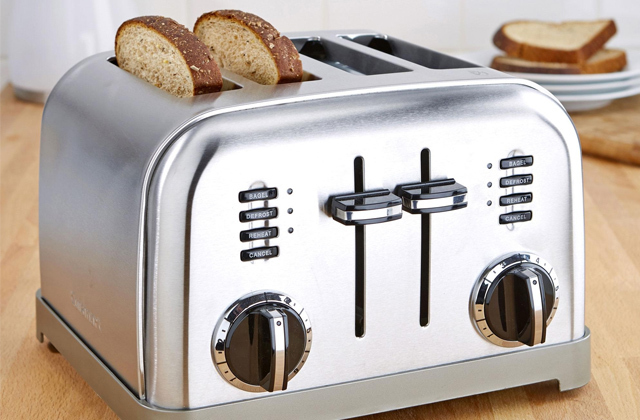 So if you need an appliance that will offer you much more than its rivals, you'll be hard-pressed to find a better choice. Those who live in studios or simply have small kitchens, know firsthand how hard it might be to organize the limited kitchen space properly and to fit all necessary appliances into it. For this very reason, many people are concerned not only about the quality and efficiency of the appliance but also about its dimensions. If you are the same and looking for a compact model, this Farberware's built-in microwave will pique your interest. Being several inches smaller than standard 24-inch built-in microwaves, this model provides both a countertop and integrated installation options. Whether you put it on a tabletop, fix over a counter, or install into a kitchen cabinet, it won’t take up a lot of space. The smaller size of the oven comes at a price of a bit smaller internal capacity. That said, the capacity of 1.3 cu.ft. is still big enough for the majority of routine kitchen tasks; you can easily make pizza, heat up a bowl for 2, or defrost a mid-sized chicken. 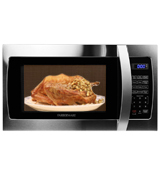 Design aside, the Farberware microwave boasts impressive functionality and 1000 Watts of power. 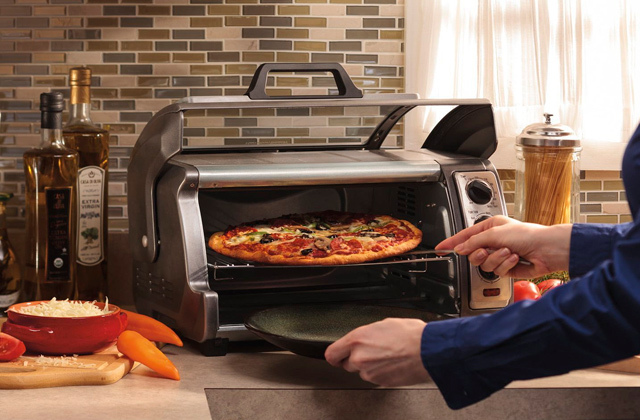 The unit features 7 auto cook options for making pizza, pasta, beverages, potato, frozen veggies, and pre-cooked dinners, 10 variable power levels and Multi-stage cooking option for uniform heating, and Custom memory function providing quick access to most frequently used settings. 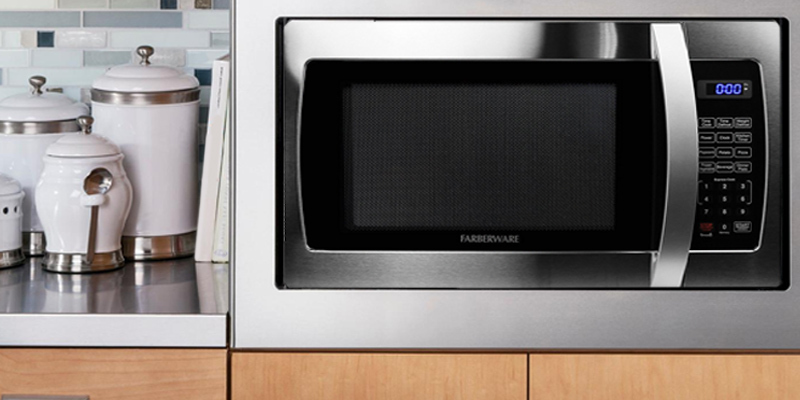 The Farberware built-in microwave cleverly unites a compact size with powerful performance and excellent functionality so it can meet the needs of smaller kitchens and 2-3 people households. Created in compliance with the highest standards, it comes at a price tag that you can afford. 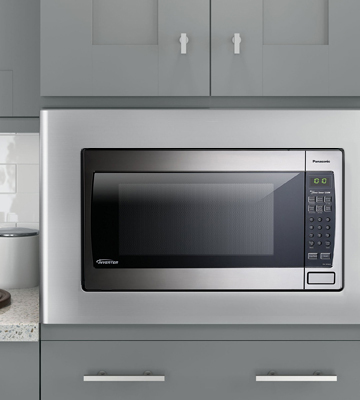 Need a microwave for a high-tech, industrial, minimalist, or contemporary kitchen interior? If so, you’ll hardly find a better option than the Panasonic NN-SN686S that will come to your liking on the first glance. This microwave looks high-end and has nothing extra that could make its interface look "busy". Featuring a mirror glass door with an electronic control panel and a steel strip at the bottom, the Panasonic NN-SN686S can seamlessly blend with facades of any kitchen cabinets. Furthermore, it has no handles, buttons, or dials that would extrude breaking the design integrity. Another thing in favor of the NN-SN686S is its small footprint taking up little of your kitchen space. Small size and cute design aren't the only strong suites of this model. Panasonic is the brand name that's best known for manufacturing smart and high-quality products. And the NN-SN686S is not an exception. This model comes packed with impressive power of 1200 Watts and has a number of options creating an exceptional cooking experience for you. The oven in questions boasts 14 auto cook modes, 3 Popcorn cooking options as well as food defrosting and reheating modes so you can cook your favorite foods across a wide range of cooking techniques. 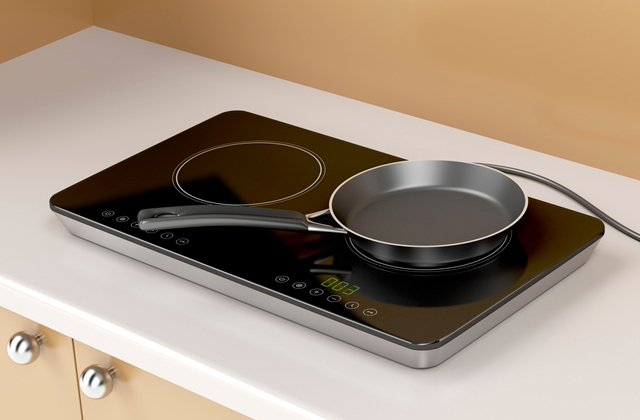 It has a smart sensor which determines the exact cooking power and temperature so that the food will not be overcooked at the end. Also, it uses Panasonic inverter technology for even and consistent results. Thanks to all these, the food retains maximum juices, flavors, and nutrients while taking considerably less time to be cooked. So whether you are an experienced cook or an amateur, having the Panasonic NN-SN686S microwave will help you achieve consistent up-to-par cooking results, requiring little to none effort. 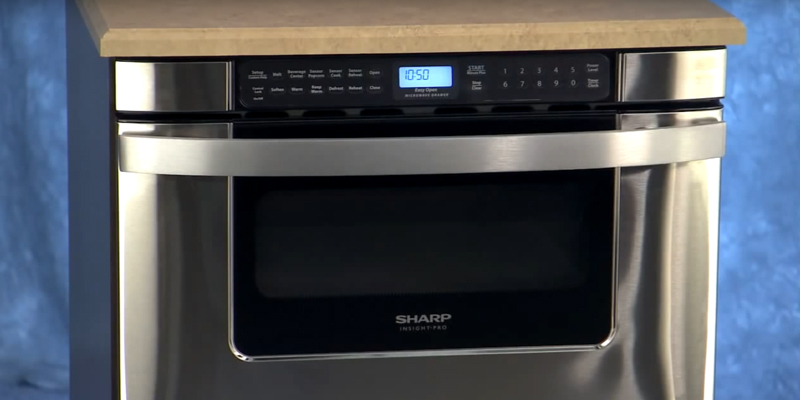 What sets the Sharp 24-inch built-in microwave apart from other units in the range is its drawer design. In contrast to models with swing doors providing quick access to the cooking chamber with a turntable, this type of microwave slides out to the front, like an ordinary drawer does, and has no rotating carousel inside. You may wonder how the microwave with such an unusual design can produce uniform cooking results. Well, the truth is, it can not only provide you with evenly prepared foods but also offer some additional benefits. Let's see what they are. Outwardly, the Sharp KB-6524PS oven strongly resembles a conventional oven with its horizontal handle and digital control panel located above it. The discrepancy between the two is that the KB-6524PS can be used only as a built-in unit. It has a drawer construction designed to fit kitchen cabinets and under a counter. This makes it an ideal solution for those who have limited kitchen space and do not know yet how and where to put a microwave. 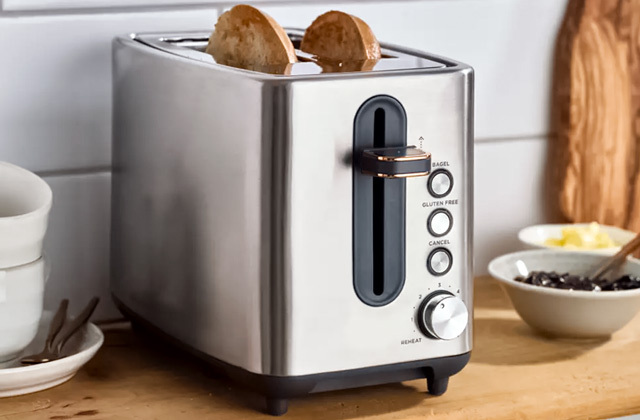 Another advantage of the Sharp KB-6524PS is that, unlike many undercounter models, this one has a sliding design, meaning you will not need to bend when extracting hot foods out of it. Compact in size, the interior capacity of the Sharp KB-6524PS is nothing short of amazing. It can easily accommodate a 9x13” casserole dish, tall bowls, and other larger dishware. Externally, the microwave looks very modern. It has a stainless steel housing that perfectly blends with any contemporary, high-tech, minimalistic and industrial style. 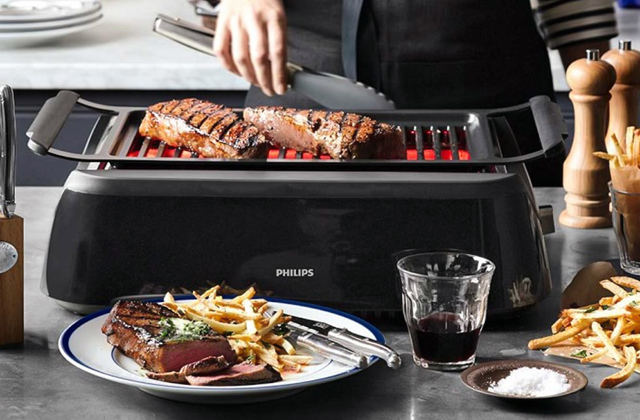 It features a wave stirrer at the top and generates 1000 Watts of power ensuring you can get both even and quick cooking results. With customers in mind, the Sharp KB-6524PS provides dozens of settings, with many of them automatically adjusting the power and time during the cooking cycle. Considering the budget price tag of this oven paired with its so many practical features, the Sharp KB-6524PS is one of those models that will be able to please even the pickiest customers. What Is a Built-in Microwave? Normally, when remodeling the kitchen, we want it both to look stylish and to be maximum convenient. Built-in kitchen appliances are specifically designed to serve that purpose. 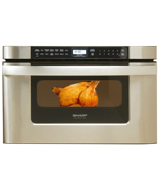 Built-in microwaves are one of the most popular in this category. Unlike free-standing countertop models, they require installation. Usually, they can be embedded into kitchen cabinets, islands, or simply built into a wall. 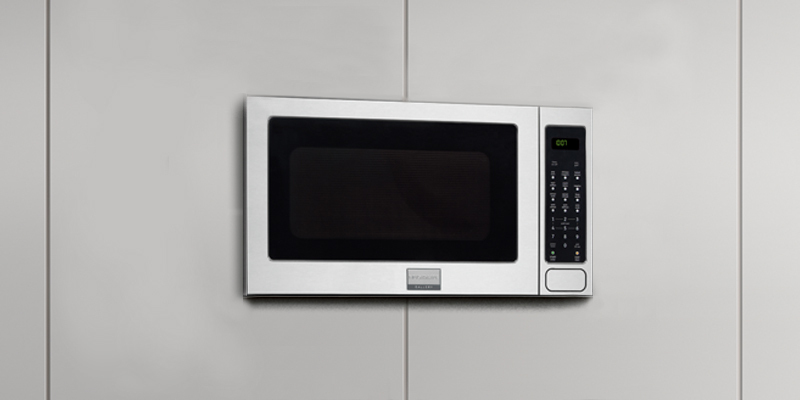 Hence, built-in microwaves are meant predominantly for the use in permanent residences and are not the best option for dormitories, offices, and rented dwellings. The biggest benefit of the built-in models is a free countertop space they provide. Even if your kitchen counter is too narrow for a high-capacity microwave, you can afford a larger model if you go for a built-in design. 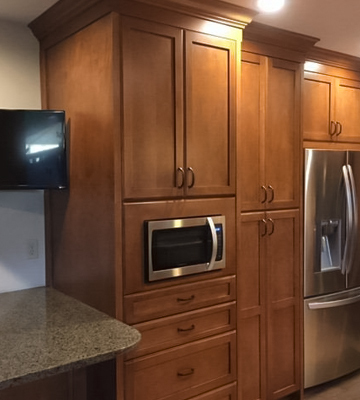 In general, built-in microwaves include over-the-range units that are installed over the cooktops and also functioning as range hoods, cabinet models that can fit virtually any space, and drawer microwaves which are great for open area kitchens and studios. By functionality, built-in models are pretty much similar to countertop units and will let you both cook and reheat meals. 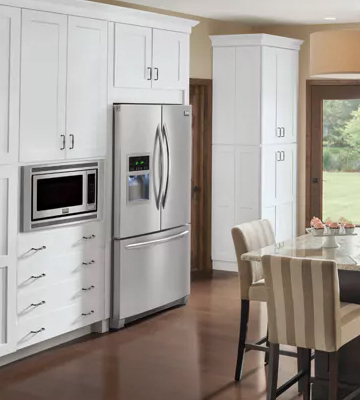 If you plan a complete kitchen renovation and would like to furnish it with custom cabinets, we'd recommend that you turn your attention to our selection of built-in refrigerators, another space-saving appliance that will perfectly fit even quite limited kitchen space.